Most particle optics devices exist within a grounded vacuum chamber, which is a vacuum tight, grounded, conductive metal chamber completely surrounding the device. Isolates fields from inside the field from those outside, thereby providing more reproducibility. You don’t want the external environment (e.g. placement of other instruments or static charge) affecting your instrument. This cage basically operates as a faraday cage (Wikipedia:/Faraday_cage), which provides Electromagnetic Shielding. Reduces the possibility that voltages in the device might be accidentally touched and shorted to ground (Electric Arc), thereby harming the user and/or the device. Provides a closed container that can hold vacuum. Most (not all) ion optical devices operate under high vacuum or reduced pressure since background gas can interfere with ion motion (as elaborated in Ion-Gas Collisions). As a Faraday cage: If the ground chamber need not maintain a vacuum, it will serve as merely a Faraday cage (Wikipedia:Faraday_cage). This can then have small holes or be constructed of a wire mesh, which can still maintain much of its electric field shielding properties. With a Grid, the field penetrates only a small distance through the holes. Ground definition: By “ground” we typically mean electrical earth ground, but this is not required. The reference potential against potential are measured is, after all, relative. Simulation: The ground chamber also provides a convenient Dirichlet Boundary Conditions when solving the Laplace Equation in your simulations. See First Uniqueness Theorem for details. Ground chambers (ground cans) are also mention on p. 6-3/6-4 of the 7.0/8.0/8.1 SIMION User Manual. Examples: Figure 1 shows how ground chambers isolate prevent fields inside and outside from interacting. Figure 2 shows even a Faraday cage with holes provides electrostatic shielding. 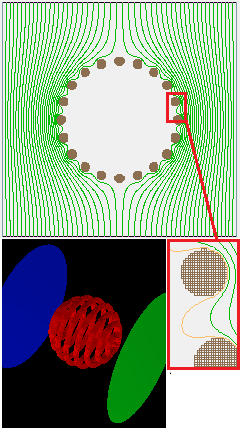 Relation to magnetic shielding: A ground chamber shields electric fields. In contrast, for shielding magnetic fields, a Helmholtz Coil or mu metal metal might be used, especially since Earth has a non-negligible magnetic field. The Faraday cage does, however, have electromagnetic radiation shielding capabilities because it interferes with the electric component of the electromagnetic wave. Theory: See also First Uniqueness Theorem. Fig. 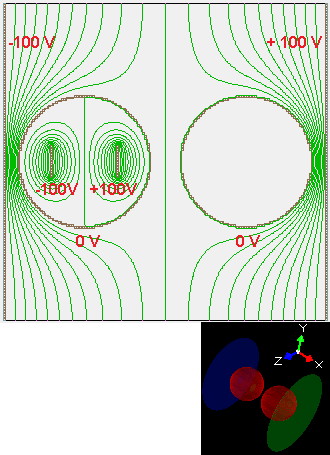 38 Figure 1: Two ground chambers (closed conductive electrode surfaces) inside an external field, with potential contour lines (green). The left chamber contains electrodes of other potentials. Observe that fields do not penetrate into the ground chambers (e.g. right sphere has no fields), and neither do fields penetrate out of the ground chambers (e.g. external field is symmetric despite one ground chamber containing fields inside it). Fig. 39 Figure 2: Grounded Faraday cage of rings, within external electric field. Equipotential lines (green and orange) also shown in axial plane with zoom plus 3D view. Observe that external field penetrate only weekly through the holes in the cage. This is “faray_cage_rings_2dc.gem” in SIMION Example: geometry (SIMION 8.1.1.30).